Home SEO What is meta tags? When you start building your actual site, one important on-site technique you can implement is the inclusion of meta tags in your web pages. 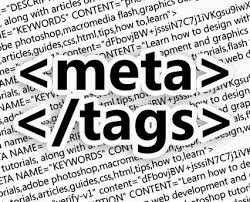 Meta tags are the special snippets of code that are included before the body content of your site that contain information about your site’s name and purpose. Other than the title tags, these tags aren’t visible to visitors on your site, but they provide valuable information to the search engine robots that determine which search terms to display your site for. The first tag you should include is a title tag, While this isn’t exactly a meta tag, it’s usually categorized as one because it occurs in the “HEAD” area of your webpage (before the body region). However you’d like to categorize it, this tag helps the search engines scouring your site to figure out what the page is called and what should be displayed in the search results. For search engine optimization purposes, it’s important to include your page’s main target keyword or keyphrase in the title so that search engines will know to display your site when a user searches for that specific term. Many sites also make use of description meta tags – although many SEO experts disagree about whether they actually contribute to your site’s SEO. At the very least, description tags let you control the paragraph of text that will be displayed below your site’s name in some of the search results. This meta tag controls what will be displayed in the search engine results when your site comes up in the rankings. Natural search results usually display the page’s title and description. So even if meta description tags don’t contribute to improving your site’s rankings, writing a good description may help convince search engine visitors to click through to your site. You can even use this description as an opportunity to pre-sell potential visitors on any products you’re selling with persuasive, targeted language. Another good on-site search engine optimization technique is to frequently update your site with fresh, new content. The search engines love sites that are regularly updated. When you add new content be sure to let the search engines know that you’ve updated with your site with XML-compliant sitemaps.